In his recent decision in the case of Williams v. Beavers, No. 13-CV-1825 (C.P. Lacka. Co. Sept. 9, 2015 Nealon, J. 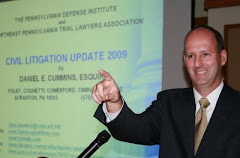 ), Judge Terrence R. Nealon of the Lackawanna County Court of Common Pleas addressed a Motion for Summary Judgment in a case involving a Defendant who allegedly made a negligent U-turn. The Defendants filed a Motion for Summary Judgment arguing that the Defendant driver had not made an illegal U-turn. The court reviewed the motion under the U-turn law set forth at 75 Pa. C.S. §3332(a). Judge Nealon noted that there was sparse law on the issues presented. The court did note that the mere fact of making U-turn does not constitute negligence per se under Pennsylvania law. However, the law does require a motorist making a U-turn to first assure that the maneuver can be completed safely without interfering with any approaching traffic. Moreover, other motorists are not required to anticipate that another driver will make a U-turn into their path of travel. After reviewing the record before the court, Judge Nealon found that issues of fact were present such that the motion should be denied and the case allowed to proceed to a jury for a determination. Anyone wishing to review this Opinion by Judge Nealon may click this LINK.